There are few times when surgery is appropriate for dizziness. Most disorders either can be treated effectively medically, or there is no treatment at all. Surgery cannot be guaranteed to work (Teufert et al, 2007), and there are certainly situations where it fails (see end of this document). We will discuss corrective and destructive surgical treatments. Unfortunately, there are relatively few instances where surgery can be viewed as a corrective procedure for vertigo. Interestingly, in all cases where there is a proposed corrective surgery, either the process of diagnosis is controversial, or the treatment itself is controversial. This suggests that caution is appropriate when a corrective surgical procedure is proposed to treat vertigo. Figure 1. Round window fistula. An opening in the round window allows perilymph to leak out into the middle ear. In this artist's depiction, for clarity, bone is not shown between the middle and inner ears. While it is difficult to be sure, it seems likely that in most cases there is only a small oozing of fluid between the perilymphatic space and the air-filled middle ear. In perilymph fistula, surgery may be used to plug a leak in the inner ear. Both the diagnostic process and the treatment is somewhat controversial. Conventional treatment involves exploration of the ear, and placement of a "patch" over the window areas. We have found in our practice that placement of a tube or grommet in the ear drum can be effective. Medical treatment is poor for PLF and in most cases the patient will have to decide between living with the symptoms or proceeding with surgery. Figure 2. Ventilation grommet placed in ear drum. By providing an artificial opening in the ear drum, pressure fluctuations between the middle ear and outside world can be avoided. This is sometimes helpful in treatment of perilymph fistula. Recently a new type of fistula has been described involving dehiscence of the superior canal. Whether or not surgery will be effective for this syndrome is presently uncertain. Attempts have been made to treat it using patches, but sometimes the result is catastrophic to hearing. We have also encountered several patients in whom complete vestibular loss followed an attempt to plug the superior canal, for unclear reasons. It is our opinion that PLF surgical treatment varies greatly across the country and sometimes even within the same metropolitan area. We advise caution and a second opinion, best obtained from outside the local medical community, when considering surgical treatment for PLF. Most otologic surgeons in the United States perform only about 5 of the "patching" operations/year. In our view, this reflects a reasonable frequency of surgery for the usual local otology practice. A higher frequency of surgery than this suggests that either the surgeon is having fistula cases referred in to him/her from outlying areas or that he/she is unusually aggressive. A lower frequency of surgery than this may mean that the surgeon is more conservative as well as less experienced than the majority of his/her associates doing otology. In the microvascular compression syndrome, surgery may be used to move a blood vessel off of the vestibular nerve. Medical treatment is uncertain for MVC syndrome, as it is very difficult to establish the diagnosis. This surgery is difficult and is best done by an experienced neurosurgeon. In our practice in Chicago, we have never encountered a patient whose dizziness improved following microvascular compression surgery. This is not to say that there is no indication for this surgery, but as is the case with fistula surgery, we would advise caution and judicious second opinions, ideally from outside the local medical community, before proceeding with such surgery. 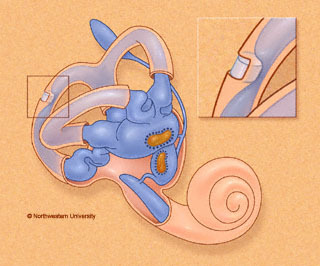 In Meniere's disease, endolymphatic sac shunt surgery is intended to improve inner ear plumbing. Opening the sac was first proposed by Portman in 1926. There is controversy primarily in regard to whether this procedure is effective or a placebo, or worse (Thomsen et al, 1981). Several authors have reported that obliteration of the endolymphatic sac is as effective as shunting it (Welling et al, 1996;Gibson et al, 1994). This observation would suggest that the rationale for shunt surgery is questionable, and also that shunt surgery might be better considered as a destructive treatment. Nevertheless, the consensus in 1999 was that shunt surgery is modestly effective for several years. 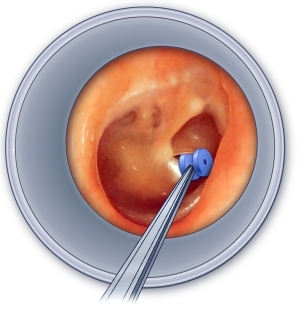 It compares very unfavorably in effectiveness with transtympanic gentamicin (see destructive procedures below), but it has the advantage of not affecting hearing (if all goes well). It may be roughly equivalent to medical treatment (which isn't very good either). Shunt surgery in the US gradually increased between 1990 and 1999, but it has been surpassed by the much more rapidly growing transtympanic gentamicin procedure(see below under destructive procedures). All treatments for Meniere's must be compared with the natural history of Meniere's, where 60% of patients are in remission by 6 months. The most common type of shunt surgery consists of putting in a small tube or plastic sheet into the endolymphatic sac. Another procedure is termed "endolymphatic sac enhancement", a procedure which includes "lateral sinus decompression" (Sajjadi, Paparella and Williams, 1998). Shunt surgery is generally felt to be ineffective when viewed over 5 years although it may improve the situation for 2 years. The most disturbing report came out of the "Danish Sham Study", where individuals treated with placebo fared better than those with shunts. There is also good evidence that tubes placed in the sac close up by 4 years. Nevertheless, it is possible that procedures that either destroy the sac or remove surrounding bone through which lymphocytes migrate into the sac might alter its immune function enough to cause a remission of Meniere's disease. To summarize, at this writing, shunt surgery may have some short term benefit, and the mechanism of the benefit may relate to immune modulation. It is our view that shunt surgery is presently overutilized. We think that it will be gradually replaced by transtympanic gentamicin (see destructive section), or more effective medical treatments for Menieres disease. Chronic ear disease includes a wide range of ear disorders including chronic otitis media, chronic mastoiditis, tympanosclerosis and cholesterol granuloma. Processes that cause vertigo are those that can involve the inner ear and are mainly mastoiditis and cholesteatoma. Most treatments involve opening up the middle ear space to allow it to drain and an infection to resolve. Procedures include atticotomy (removal of the lateral epitympanic wall (scutum)), as well as several types of mastoidectomy. These are designed to eliminate vertigo, possibly sacrificing hearing. These procedures are appropriate for consideration when medical treatment and vestibular rehabilitation has failed to control vertigo symptoms. By medical treatment we mean a vigorous and informed regimen of treatment supervised by a physician who is familiar with dizziness and its pharmacology. Indications are generally much clearer for destructive treatment than for corrective treatments, and results are better. Vestibular Rehabilitation therapy is appropriate in all patients after destructive treatment. Figure 3. Gentamicin injection for Meniere's disease. For Meniere's disease, destructive procedures are associated with better control of vertigo than shunt surgery, showing good control in over 90% of patients followed for 5 or more years. VNS (vestibular nerve section): The vestibular nerve may be sectioned via the middle fossa, retrolabyrinthine, and retrosigmoid approaches, with similar efficacy. Nerve section can fail due to a variety of reasons -- the nerve may be incompletely sectioned, it may regrow, a neuroma may form, or the diagnosis might have been wrong. An example of an incomplete section is shown here. These procedures decreased by about 1/3 in frequency between 1990 and 1999, in favor of transtympanic gentamicin (Silverstein et al, 2003). In our practice in Chicago, we use gentamicin roughly 50 times as often as VNS. Transtympanic gentamicin treatment , sometimes called a "chemical labyrinthectomy", is a rapidly growing outpatient procedure (Silverstein et al, 2003) that offers similar results to vestibular nerve section but with less risk. As of 1999, about three times as many gentamicin procedures were performed than nerve section or surgical labyrinthectomy. The "low dose" variant is extremely effective -- with about 80% control of vertigo without any significant morbidity. Labyrinthectomy is appropriate for patients in whom there is no hearing in the ear which is causing vertigo and offers excellent control of vertigo, with less complications than nerve section. Recurrent vertigo is much less likely after labyrinthectomy than nerve section (Badke et al, 2002). Destructive treatment is generally entered into with much less enthusiasm when there is evidence for bilateral Meniere's. As 35-50% of persons with Meniere's eventually develop bilateral Menieres (we think the 35% statistic is correct), this excludes a substantial proportion of the population with this disorder. It is our view that transtympanic gentamicin treatment, at the present writing, is under utilized. It is a very effective treatment with little risk. It is our view that labyrinthectomy and vestibular nerve section surgery are presently being overutilized, and as time goes on, they will largely be replaced by gentamicin treatment. We sometimes recommend very low dose gentamicin treatment in patients with bilateral Meniere's disease. Removal of the acoustic tumor in acoustic neuroma surgery generally results in elimination of vertigo, as the nerve is usually sectioned. Other destructive treatments of acoustics include gamma knife (radiation) treatment. It is our view that acoustic neuroma surgery is presently generally being done for the correct reasons and by very well trained and informed surgeons. In individuals who fail fistula surgery (for perilymph fistula), a destructive treatment also seems reasonable when symptoms are disabling. Here options might reasonably include a vestibular nerve section or labyrinthectomy, should hearing already be severely impaired. It is rare to encounter a situation where destructive surgery is contemplated for PLF. Nevertheless it is a reasonable last resort, best considered after the more conservative approaches have failed. We have encountered two patients with disabling PLF, who returned to work after a vestibular nerve section was performed. Two lives were dramatically better ! Vestibular nerve section is presently an under utilized procedure for disabling PLF. Figure 4. Posterior canal plugging for Benign Paroxysmal Positional Vertigo (BPPV). For Benign Paroxysmal Positional Vertigo, selective posterior canal plugging offers a reasonable surgical approach to intractable symptoms. 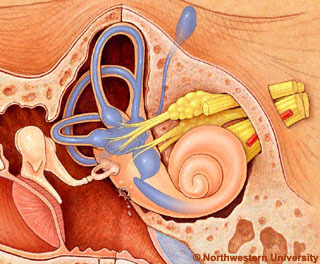 Singular neurectomy, an older procedure, is less popular because it produces hearing loss in 7-17% of patients and fails in 8-12%. Vestibular nerve section seems unreasonably aggressive for BPPV, as does transtympanic gentamicin. Destructive treatments might also be considered for variant BPPV such as cupulolithiasis, as well as BPPV involving other canals than the posterior canal. Cupulolithiasis is the most difficult form of BPPV to manage and therefore might be the most reasonable one in which a destructive treatment should be considered. On the other hand, cupulolithiasis is rarely a source of severe vertigo. It is our view that destructive treatments for BPPV are being rarely used, and when they are, generally the indications are appropriate and the results are good. We generally do not think that destructive treatments are appropriate for vestibular neuritis, but there are occasional exceptions, when medical treatment fails and symptoms are severe. We also do not feel that destructive treatments are indicated when the diagnosis is unclear. Destructive treatments are risky for continued vertigo when there is impairment of central adaptation, such as in seniors and in people with pre-existing cerebellar problems. Of course people don't like to talk about failure, but realistically, we all know that when we bring our car into the shop, it might still have a problem, or even more problems, when it comes out. The situation is the same with surgery for dizziness. Like the case with most endeavors in life, the more chances you take, the higher the likelihood of a catastrophic result (as well as a cure). On the other hand, taking considerable risk can be reasonable in situations where there is little to lose. People differ substantially in personality, and one cannot reasonably say that the optimal approach for one person will necessarily generalize to all people with the same medical situation. In other words, we do not favor the idea that there should be a "one algorithm fits all" patients with dizziness surgery. With that out of the way, lets go on to consider the uncomfortable topic of surgical failure. Surgical treatment of vertigo can fail for many reasons. In our dizziness oriented medical practice in Chicago, we have encountered numerous surgical failures. Here are some of the most common situations. This is a substantial problem as many persons with Meniere's disease have migraine. Example - - patient with latent nystagmus operated on 14 times for a supposed fistula. "cryptic" vertigo treated by destructive surgery. Bilateral Menieres disease, treated with gentamicin on one side, causing substantial collateral damage. Fistula surgery -- only about 50% effective. Teufert and associates discussed 111 patients with persistent vertigo following surgery for Meniere's disease. the great majority of patients had destructive procedures-- vestibular nerve sections or labyrinthectomy, and about 1/4 had endolymphatic shunt. They reported that poorer outcome was correlated with greater disability prior to surgery, contralateral tinnitus, vertigo as a first symptom, and presence of eye disease. In this situation, the "cat is out of the bag", and it is generally best to avoid more ear surgery, and to emphasize non-destructive management -- medication and physical therapy. We hope that by 2020, there may be capability to regenerate the inner ear in humans, as research is going on concerning gene therapy. It is important to note that this treatment, should it ever become available, will not be able to correct for damage to the vestibular nerve (such as in VNS surgery), or labyrinthectomy. For this reason, these approaches to dizziness treatment should be reserved for very severe situations. Portmann G. Vertigo, surgical treatment of opening of the saccus endolymphaticus. Arch Otolarygol Head Neck Surg 1927;6: 309 – 319. Teufert, K. B., K. I. Berliner, et al. (2007). "Persistent dizziness after surgical treatment of vertigo: an exploratory study of prognostic factors." Otol Neurotol 28(8): 1056-62.